I come from music, through my mother. When I was little, music was how we lived. I knew how she was feeling by what song she was singing, or what record was in the player. We had to sing on road trips to keep her awake, and some of my earliest memories are of sitting on the floor surrounded by her and other musicians. She gave me music in everything. So there was never any question my kids would have music. But how they had music has changed many times over the years and, like so many things, I've failed them many times along the way. Unschooling (like parenting; life) is a journey of failures and discoveries that ultimately lead to the rest of our lives. I thought I would share some of our music journey, in case it is encouraging to someone just hovering on a precipice of this crazy trip. When my kids were little they were surrounded with music all the time, through recordings, through my constant playtime singing, through the songs I sang while I worked in the house and they were busy in another room, and through the many parties and group music events we attended with other folk musicians. Playing, dancing, or drawing in a room full of music was their happy place. This was our life and, although it isn't anymore, it was a wonderful foundation. No lessons, no expectations, just music, everywhere. We weren't even doing it for the kids - it was just our life, which meant, most importantly, that their everyday lives included watching their own parents engaging with music, and they learned how to do it. For that handful of years, I think we got it right. There's plenty of evidence for the benefits of singing with babies. We even acknowledge the benefits of song and dance for young children, but sometime after our kids leave preschool, many of us begin to lose sight of the importance of music. As our kids get older and we become more and more concerned with their academic futures, music often becomes a skill to be taught in a regimented way, with little or no value given to the actual playing of music. After all, we say we play music; we don't work it. Music is meant to be played, and play is fun. Worse still, music sometimes becomes a leisure activity, and given little value in our school and life-plans. The older our kids get, the more music becomes either a leisure-only activity, or a structured academic pursuit. I destroyed music by allowing this to happen in my home. 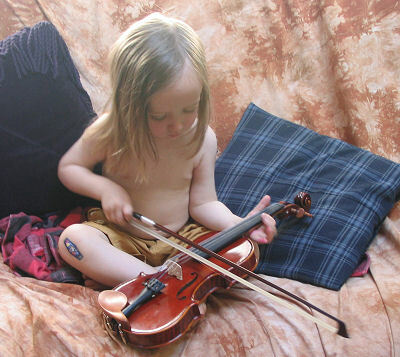 My son loved violin. I mean he LOVED violin. He seemed to arrive in the world pre-programmed to desire a violin and to make beautiful sounds come out of it. So, his loving grandmother (the one who brought music into our family) bought him a violin, and also tried to teach him - with all the adoring love of a grandmother giving her own greatest love to her first grandchild. Somebody putting tape markers on his violin was the first offense - no matter how well-intentioned and lovingly it was done. The series of amazingly thoughtful and ridiculously talented and inspiring teachers he then had for violin and cello were the last straw. And I have to say - we chose teachers who truly taught to our son's wild and stringent standards of freedom and inspired genius. He adored them. He thought they were the coolest people in the world. However, he lost interest in stringed instruments. Our daughter decided she wanted to become a singer, and took up the guitar. She took voice and guitar lessons with teachers who similarly listened to her desires and tailored their lessons to her own measured and regimented but highly alternative style. She had excellent teachers, and she learned a lot from them. But she also eventually declared her own independence, and quit her voice lessons. The thing about unschooling is, kids always have the right to quit. And mine take this very seriously. Amazingly, although we apparently failed at providing music instruction, both of our kids still make music. My son plays accordion (the one instrument nobody tried to teach him), and has on occasion gone busking in the city. My daughter is still working on her dream of becoming a singer, performing in musicals regularly, and developing a fledgling YouTube presence. But it's not these public pursuits that give me hope. It's the quiet moments while they're working on puzzles and humming to themselves, or cleaning the kitchen while singing an extremely loud improv session, together. It's the way that when they play, music seems to work its way in. It's the way that their very best friends are happy to sit down and make music with them; that when we drive in the car, they sing. We sometimes speak in lyrics. It's not because I know these experiences are beneficial that I encourage them, it's because they make me happy. I was raised in a home where music was the expression of our lives. I hope my grandchildren will say the same thing.